Palacio, 47, started feeling poorly last week and eventually visited a doctor with complaints of dizziness and blurred vision. On the 16th of January, he began experiencing seizures and was rushed to a hospital in Belmopan, Belize, and then on to another hospital in Belize City. At this point, most people were hopeful Palacio would recover. On January 17th, Palacioâs condition worsened and he began experiencing more seizures. He was placed on an air ambulance to Chicago where he was expected to get treatment at one of the premier neurological facilities in the country. En route to Chicago, the plane stopped in Mobile, Alabama, to clear immigration. At that point, Palacio was unconscious, and it was determined that he was too ill to continue on the flight to Chicago. He was rushed to a hospital in Mobile, and placed on life support. There, doctors determined that the damage to his brain function was severe, and that his chances of recovery were slim. On January 18th, his family requested that he be flown back to Belize so that he might die in his homeland. A national hero in Belize for his popular music and advocacy of Garifuna language and culture, news of Palacioâs condition sent shock waves through the community. At 5pm on Saturday, a public service was held in Belize City for Palacio as people prayed for his recovery. Ceremonies were also held by Garifuna spiritual leaders in an effort to help with the situation. Belize is in the midst of a heated election, but the local news was entirely dominated by Palacioâs health crisis. The reaction has also been strong around the world. Until the recent turn of events, the past year had been one of tremendous accomplishment for Palacio as his album /WÃ¡tina/, which was released at the beginning of 2007, had become one of the most critically acclaimed recordings of the year in any genre. Perhaps the most unanimously revered world music album in recent memory, /WÃ¡tina /appeared on dozens of Best of the Year lists in major media outlets around the globe and was roundly praised in glowing terms. In 2007, Palacio was named a UNESCO Artist for Peace and won the prestigious WOMEX Award. /WÃ¡tina /was also nominated for the BBC Radio 3 World Music Awards. 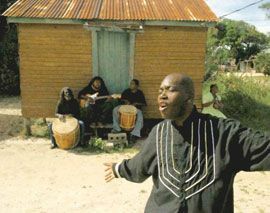 At home in Belize, the international success of /WÃ¡tina/ has sparked a revival of Garifuna music, as young musicians have become inspired by Palacioâs example. Even in the days since Palacioâs health crisis began, the accolades have continued to pour in for his work.